« Happy New Year – Kate’s Getting Cuter! Sorry Buckeyes….There’s always next year. 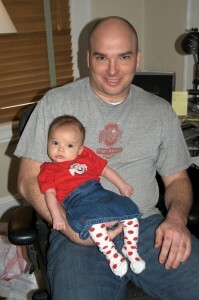 Kate is a huge buckeye fan, just like her parents. She was so excited about the big football game last night, but she could not make it to see the game. Dad did not make it either – Kate and dad fell asleep on the couch before kick-off. We did not have the heart to tell her the buckeyes lost, so we dressed her in her buckeye gear to celebrate the next season! There is always the 2009 season! This entry was written by John, posted on January 6, 2009 at 5:00 pm, and filed under Uncategorized.